$419. 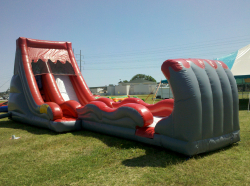 This Supersized Volcano Extension slide will make a Big splash at your event. Riders climb up 15ft and then slide down a 40 wet foot slide with speed shooting them out of the Volcano.